Terrasol Beach Condominiums are located at the tip of the Baja Peninsula within walking distance of Lands End and Lovers Beach and easy walking distance to Downtown and Marina.The beach is anchored by the scenic rocks of Lands End and Pedrigal at the other end keeping it private and secluded. Terrasol Beach is private, very quiet and peaceful, no vendors, with wonderful whale watching and fishing directly off beach. Our patio is surrounded by bougainvillea and hibiscus and within four minutes walk off our patio your feet are in the ocean! World-class fishing, golfing, snorkeling, and diving are minutes away. One of the very few privately owned condominium properties on the ocean. Pets are NOT allowed, No Smoking. Parking on property - very close to condo. Ed and I are both retired and have the time to be able to spend part of the Canadian winters out of the country. Ed's daughter and son-in-law live in Cabo San Lucas which means we are not only visiting family but have family to look after our condo while we are away. Both of us take pride in our home away from home and keep it well maintained and up to date. My husband and I bought our condo in 1994. I had been raised on the coast in Wales and wanted desperately to have a second home on the ocean. We looked up and down the west coast of Canada and the US and found that in most places it was just not warm enough in Feb/March so ventured further south down to the Baja where Ed's daughter lived. We chose Terrasol in Cabo San Lucas, not only because the weather was beautiful in those months of the year when we wanted to get out of Calgary, Alberta, but because it was the only privately owned condominium complex in the area that is built right on the sand. The beach is private with no vendors and absolutely beautiful and the complex is secure and peaceful. To add to that, the centre of Cabo San Lucas is within very easy walking distance. Our condo has become our home away from home during some of Canada's winter months. The whales, on their migration south and on their return home in the Spring, pass right by our beach and often are within 100 yards of the shore breaching and sky-hopping. It's close to paradise. Cabo San Lucas is a very safe environment to live. The Mexican people are extremely friendly and will go out of their way to help you. Our property is gated and we sleep with our screen door open at night without any concerns. At night the property is well patrolled. Terrasol has time-share properties on either side of it so our situation is totally unique in that all the condos are privately owned. I have walked the beach on many occasions when there are no more than 5 or 6 people on it. Ofcourse, if a whale comes close to the beach and starts performing then it gets a bit busier but of an afternoon I will take my chair to the water's edge and there will be hardly anyone around to disturb my peace. And if we want more action or to go out to a nice restaurant, of which there are many in Cabo, then we can walk into town very easily. In fact I walk from our condo every morning to the far side of town and back enjoying the activity on the marina. The kitchen has just been renovated with new cupboards, granite counters, new over-the-stove microwave, new sink and faucets, new s/s fridge and dishwasher, new flat top stove. Glass dining table seats six. Placemats and napkins provided. Please advise if highchair is needed as it is stored in garage. Dish tv. Newly built tv/bookcase unit with flat screen tv and Blue Ray dvd player. Bouganvillea and Hibiscus plants on our patio and outside both the front and back doors. Large 1800 square foot Condo, Large Patio, Large Living Area, 1 King-Size Bedroom in Master bedroom and another king sized bed and one twin in the second bedroom. Both bedrooms have private Bathroom & Own Air Conditioning, Satallite tv with one flat screen tv and one regular,Blue Ray dvd player. Full newly renovated kitchen with granite counters, Microwave and double fridge with ice/water, DVD/VCR, Library of Books and videos, Many condiments, spices and other cooking basics provided, Iron & Ironing Board. The two sofas and chairs have just been recovered, new lamps and rugs in the living area and bedroom, new fl flwitv/bookcase unit with lighting and door to close off tv, mantle built over fireplace, new window treatments and a new flat top oven. 2 Swimming Pools, Swim-up Palappa Bar with restaurant service, Exercise & Spa Facilities. Terrasol is our home away from home - it has everything you will need and our condo is beautifully maintained. This was our first time at Terrasol. Cilla's condo is fully loaded, everything you need, just add food!! Walk to the marina is close and easy. There are two pools, one with a swim up bar/restaurant with very reasonable prices. The other pool is right on the beach without any vendors. It was relaxing and enjoyable. Can't wait to book next year. Also, Cilla was great to deal with. Our whole experience from start to finish was exemplary. Cilla stayed in communication with us and made sure our vacation was perfect. The home is perfectly appointed, with everything any family might need for a comfortable stay. The property and location is truly a diamond in the rough. Definitely a 'home away from home'! This was the perfect place to enjoy all of the wonders that Cabo has to offer. Just a walk away from some of the best restaurants and attractions. This condo is the perfect size for a small family and was the perfect distance to the pools at the Terrasol. We will definitely keep this in mind for our next trip to Cabo! First time in Cabo and will be back! This was our first time in Cabo and we have already planned our dates to come back. First off, Cilla was excellent with her communication and responded to all of our questions very quickly. The condo is in a prefect location and has all of the amenities needed during the stay. Even though the condo doesn't have an ocean view, it was just steps away from the ocean and perfect to walk to the marina. While staying at the Terrasol, we met several people who have been coming back to this location for years and I can understand why. The property is well kept, secure and a great place to relax while on vacation. We often ate at the Palapa bar on site for breakfast, lunch or a late snack and had cocktails. Mario and his staff are excellent and the food was wonderful. We did not rent a car while staying and we honestly did not need to. Each morning we would walk to the marina and around the neighborhoods to explore dining options. We ate breakfast out at several restaurants including Solomon's Landing, Captain Tonys and Mama's Royal Cafe. In the evening, we would walk back to the marina to eat dinner and find happy hour specials. Some of the restaurants around the marina are a little over priced and next time we go, we will eat at more of the neighborhood restaurants for a much cheaper price. We met many of the locals and just enjoyed our time sightseeing at the marina. We did several activities during our stay. We rented a private boat from Victor at Solomon's Landing for $50 a person to do whale watching and this included our captain, Lorenzo, explaining and showing us around Land's End. We climbed over the rocks at the end of Solmar beach to go to Divorce beach and Lovers beach and then took a taxi back to the marina. We climbed Mount Solmar which is located next to the resort to enjoy the views of the Pacific Ocean and Sea of Cortez. You are not able to swim in the Pacific Ocean however we spent our time at the pools and you can swim at Medano beach which is very close. We did visit the Playa Grand Resort next door and walked by several other resorts on the beach. Without a doubt, we chose the best resort for our stay. 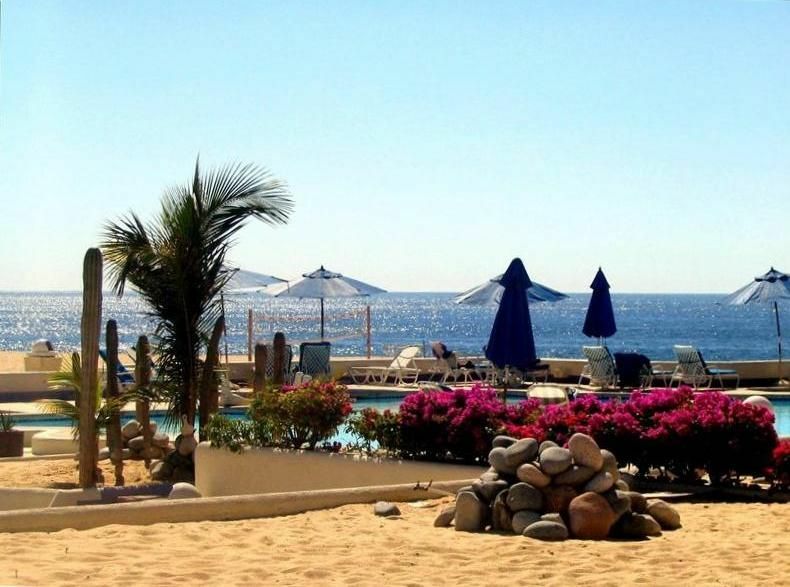 World-Class Golf nearby, Large Variety of Restaurants & Shops in the Resort town of Cabo San Lucas (easy walk distance from condo along Marina), World-Class Fishing, Water Taxi to other Beaches. Our normal US$ rate is $350 per night over the Christmas period and $200 US for the remainder of the year. This fee includes the Terrasol nightly fee which we pay on your behalf. Our preferred method of payment is a US$ cashiers cheque.